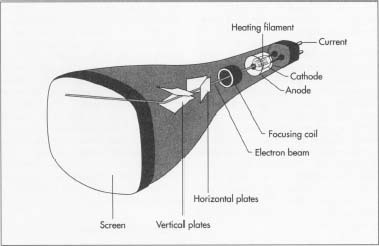 A cathode-ray tube, often called a CRT, is an electronic display device in which a beam of electrons can be focused on a phosphorescent viewing screen and rapidly varied in position and intensity to produce an image. Probably the best-known application of a cathode-ray tube is as the picture tube in a television. Other applications include use in oscilloscopes, radar screens, computer monitors, and flight simulators. The cathode-ray tube was developed in 1897 by Ferdinand Braun of Strasbourg in what was then the French-German region of Alsace-Lorraine. It was first used as an oscilloscope to view and measure electrical signals. In 1908, A.A. Campbell-Swinton of England proposed using a CRT to send and receive images electronically. It wasn't until the 1920s, however, that the first practical television system was developed. The concept for a color cathode-ray tube was proposed in 1938 and successfully developed in 1949. Although General Electric introduced their first television set for home use in 1928, commercial television broadcasting remained an experimental technology with only limited range and audience. It took until the late-1940s before television net-works had established themselves sufficiently to start a boom in consumer sales. Black-and-white television sets gave way to the first color sets in the 1960s. In the following decades cathode-ray tubes for televisions got both larger and smaller as manufacturers sought to satisfy consumer wants. Recent developments have included tubes with flatter faces, sharper comers, and higher resolution for better viewing. A CRT consists of three basic parts: the electron gun assembly, the phosphor viewing surface, and the glass envelope. The electron gun assembly consists of a heated metal cathode surrounded by a metal anode. The cathode is given a negative electrical voltage and the anode a positive voltage. Electrons from the cathode flow through a small hole in the anode to produce a beam of electrons. The electron gun also contains electrical coils or plates which accelerate, focus, and deflect the electron beam to strike the phosphor viewing surface in a rapid side-to-side scanning motion starting at the top of the surface and working down. The phosphor viewing surface is a thin layer of material which emits visible light when struck by the electron beam. The chemical composition of the phosphor can be altered to produce the colors white, blue, yellow, green, or red. The glass envelope consists of a relatively flat face plate, a funnel section, and a neck section. The phosphor viewing surface is deposited on the inside of the glass face plate, and the electron gun assembly is sealed into the glass neck at the opposite end. The purpose of the funnel is to space the electron gun at the proper distance from the face plate and to hold the glass envelope together so that a vacuum can be achieved inside the finished tube. The CRT used in a color television or color computer monitor has a few additional parts. Instead of one electron gun there are three—one for the red color signal, one for blue, and one for green. There are also three different phosphor materials used on the viewing surface—again, one for each color. These phosphors are deposited in the form of very small dots in a repeated pattern across the screen—red, blue, green, red, blue, green, and so on. The key to a color CRT is a piece of perforated metal, known as the shadow mask, which is placed between the electron guns and the viewing screen. The perforations in the shadow mask are aligned so that the red gun can fire electrons at only the phosphor dots which produce the red color, the blue gun at the blue dots, and the green gun at the green dots. By controlling the intensity of the beam for each color as it scans across the screen, different colors can be produced on different areas of the screen, thus producing a color image. To give an idea of how small the perforations and dots have to be, a 25-inch (63 cm) color television picture tube may have a shadow mask with 500,000 perforations and 1.5 million individual phosphor dots. The electron gun must be designed for each new application. New screen sizes, new overall glass envelope dimensions, and new image resolution requirements all require a new gun design. Brighter images may require higher power accelerating coils. Finer image resolution may require improved beam focusing coils or plates. While the basic design remains the same, the details are constantly refined. Likewise the basic design of the phosphor viewing surface is fairly well defined, but the details may change. New image resolution requirements may require a new method of depositing the phosphor dots on the face plate, which in turn may require new material processing techniques. The search for truer colors may result in new material formulations. The amount of time the phosphors emit light, or glow, after being struck by the electron beam is also important and is controlled by the chemical composition of the phosphor. This property is called persistence. In a color television, the electron beam scans the screen 25 times per second. If the persistence is longer than one twenty-fifth of a second (0.04 second), the image would show two scans at the same time and would appear blurred. If the persistence is shorter than this time, the image from the first scan would have disappeared before the second scan came along, and the image would appear to flicker. Even the glass envelope requires extensive design. Strength, radiation absorption characteristics, temperature tolerance, impact resistance, dielectric properties, and optical clarity are a few of the design criteria used when designing the glass components. Computers may be used to perform finite element analysis to evaluate the stresses in complex envelope shapes. This technique divides the part into a finite number of smaller, more easily definable pieces, or elements, and then performs the calculations for each element to spot unacceptably high stress concentrations. Using the computer, dimensions for contours and wall thickness can easily be adjusted until a satisfactory design is achieved. Cathode-ray tubes use an interesting and varied assemblage of raw materials. In many cases, it is the raw materials, not the design or manufacturing process, that determine the performance characteristics of the finished product. The electron gun is made from a variety of metal pieces. The cathode, or electron emitter, is made from a cesium alloy. Cesium is used as a cathode in many electronic vacuum tube devices because it readily gives off electrons when heated or struck by light. In a CRT, the cathode is heated with a high resistance electrical wire. The accelerating, focusing, and deflection coils may be made from small diameter copper wire. A glass tube protrudes from the rear of the electron gun assembly and is used to evacuate the air from the finished CRT. A CRT consists of three basic parts: the electron gun assembly, the phosphor viewing surface, and the glass envelope. The electron gun assembly consists of a heated metal cathode surrounded by a metal anode. The phosphor viewing surface is a thin layer of material which emits visible light when struck by an electron beam. The glass envelope consists of a relatively Rat face plate, a funnel section, and a neck section. high percentage of cadmium sulfide. The phosphors are usually ground into a fine powder before they are applied to the inside of the face plate. The glass envelope uses slightly different raw materials for each of its three component parts. The basic raw material for all of the glass components is silica. Alumina may be added to adjust the flow properties of the molten glass when forming it. Various oxides are used to lower the melting temperature. Barium oxide, strontium oxide, and lead oxide are used to provide radiation protection in the neck and funnel. The face plate, on the other hand, must have a minimum of lead oxide to prevent a discoloration phenomenon known as electron or x-ray browning. Neodymium oxide may be used on the face plate to enhance the contrast of the viewed picture. In color CRTs, the shadow mask is usually made from a thin sheet of a nickel alloy. The glass envelope or its components are usually formed at a glass manufacturing facility and shipped to the cathode-ray tube manufacturer who forms the phosphor viewing screen, fabricates and assembles the electron gun, and assembles the finished CRT. 1 The glass ingredients are weighed and mixed prior to melting. The glass is melted in gas-fired furnaces about 500-3,000 square feet (46-279 sq m) in size. If this is a continuous process, new ingredients are added to maintain a constant level as the molten glass flows out of the furnace to the forming areas. Before forming, the molten glass must be cooled somewhat and made uniform in temperature throughout. 2 The face plate is normally pressed into the desired shape by dropping a gob of molten glass into a mold and pressing on the gob with a plunger. The funnel can be formed either by pressing or by centrifugal casting. In the casting method a gob of molten glass drops into a mold, which then spins rapidly to spread the glass uniformly over the inside surface of the mold. A grooving disk near the top of the mold cuts the soft glass at the desired height so that the excess glass can be removed easily. The neck is made from glass tubing, and one end is flared to facilitate insertion of the electron gun. 3 In a monochromatic CRT the three glass components are joined together before they are shipped to the CRT manufacturer. In a color CRT only the neck and funnel are joined, and the face plate is shipped separately for further processing. The glass components are usually joined by heating the mating surfaces to a high temperature with gas jets or electric heaters. 4 In monochromatic CRTs the phosphor viewing surface is coated on the inside of the glass face plate. This is done by preparing a liquid suspension of the phosphor and pouring a measured amount into the neck of the glass envelope along with a gelling agent. After about 20 minutes, the coating has set and the excess liquid is poured off. The process for color CRTs is more complicated. First the shadow mask is made by applying a light-sensitive coating to the thin mask material, exposing it to light through a perforated template, and then etching away the exposed coating with an acid to form the millions of holes. The mask is then pressed into a slightly curved shape and attached just behind the face plate. The face plate is placed in a centrifuge and the inside surface is coated with the green phosphor material. The centrifuge spins the face plate to ensure an even coating of phosphor. A strong ultraviolet light is shown through the mask to harden the green phosphor material into hundreds of thousands of dots. The remaining material is then washed off. This process is repeated to form the red and blue phosphor dots, with the ultraviolet light being shifted a small amount each time. When this process is finished, the glass face plate is joined to the funnel. On color tubes, the phosphor dots are sensitive to high temperatures, so instead of using high-temperature gas jets, a mixture of chemical solvent and powdered glass, called a frit, is applied to the joint. This acts like a glass "solder," and the joint can be sealed at a much lower temperature. 5 The metal components of the electron gun are precision formed. If coils are used they are wound from fine copper wire. Some electron guns use metal plates instead of coils, and these plates are stamped and formed. The components are assembled either by hand or with automated machines in a clean environment. The glass tube is sealed into the base, and the base is welded into the gun assembly. 6 The inside of the glass envelope neck is lubricated with graphite, and the electron gun is inserted and aligned. The neck is then sealed around the gun. A vacuum pump is attached to the glass tube extending from the rear of the gun, and the inside of the CRT is evacuated of air. When the proper vacuum has been achieved, the glass tube is heated and quickly pinched closed to form a seal. 7 The finished CRT is tested for performance and carefully packed to prevent damage. Because the CRT is under a high vacuum, any fracture in the glass envelope could result in an inward explosion known as an implosion. Although the operating principle of a cathode-ray tube is simple, the manufacturing process requires strict controls and precise alignments. The phosphor materials must be extremely pure to achieve the desired colors. Even a tiny variance in the amount of activator used can result in a significant change in color. Likewise, when you consider that a color television CRT requires the placement of over a million tiny dots side by side on the viewing surface, even a small error in alignment could be disastrous. The principal byproduct of CRT manufacturing is scrap glass. Much of this glass is recycled. Recycled glass with a high content of lead oxide is used to provide radiation protection in CRT funnels and has completely replaced previous sources of lead oxide for this application. The worldwide market for cathode-ray tubes was estimated at nearly 400 million units in 1994 and is expected to grow at a 6% annual rate through 2000. The color television market is expected to grow at a 5% annual rate, while the color computer monitor market is expected to grow at a 20% rate. In the television market, the demand for larger television picture tubes with higher image resolution is expected to continue. One important trend is the development of high definition television (HDTV), which has scanning rates more than twice that of conventional systems. This will require new electron gun designs as well as new glass materials and technologies to handle the doubled radiation rate. Connelly, J.H. and D.J. Lopata. Engineered Materials Handbook, Volume 4. ASM International, 1991. Haider, Z. Television Glass Bulb Design and Manufacturing Developments, Glass Production and Technology International. Sterling Publications, Ltd., 1992. Fleischmann, Mark. "The Big Picture." Popular Science, November 1994, pp. 82-85, 92-95. Meeks, T. "Inside the CRT: Monitor Technology Explained." PC Novice, July 1993, pp. 40-43. Does a flat screen monitor contain the cathode-ray tubes system?